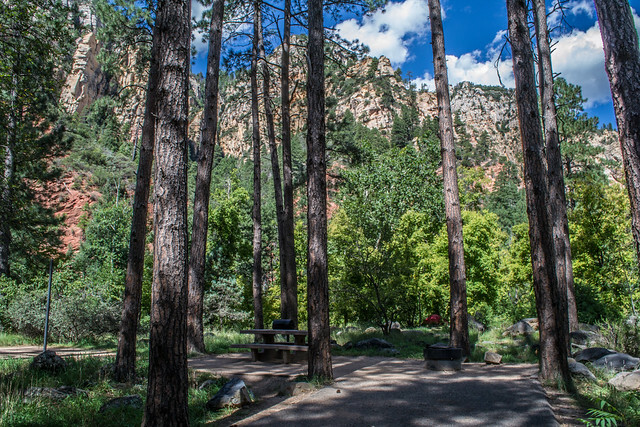 Pine Flat Campground in scenic Oak Creek Canyon is one of the Forest's most popular campgrounds. The scenery is unmatched, the stream is stocked with trout. If the fishing aren't biting, you can always go swimming, hiking or birdwatching. Slide Rock State Park (listed in Life Magazine as one of the nation's ten best swimming holes) and the thriving resort town of Sedona are only a short drive away. It comes as no surprise this area is so popular. Campsites are located in a shady stand of ponderosa pines in the upper reaches of the canyon. Many of the campsites are located right on the banks of Oak Creek, and none are very far from it. There are several hiking trails in the vicinity. Some lead up the canyon slopes to offer good views of the surrounding scenery. The creek is bordered with paths that lead along its picturesque course offering great bird watching and good fishing. 18 of the 56 campsites can be reserved. Call 1-877-444-6777 (International 518-885-3639, TDD 877-833-6777) or online at Recreation.gov. See the Camping and Day Use Reservation Policies on Recreation.gov for information on cancelations, refunds, and other details. Discounts: Senior and Access Interagency passes are accepted for a 50% discount on single-site camping fees. Other Interagency passes are not accepted. No radios or amplified devices allowed. Visit Water Quality for information about the water hydrant on State Route 89A near Pine Flat Campground. Location: 14 miles south of Flagstaff, 13 miles north of Sedona in Scenic oak Creek Canyon. Access: On US Highway 89A, drive south about 14 miles from Flagstaff or north about 12 miles from Sedona. Located just off Hwy 89A to the west. Attractions: Camping, fishing, swimming/wading, hiking, sightseeing, wildlife viewing, and photography. No. of Sites 56 single-unit sites.